Global sales of passenger cars are forecast to hit 78.6 million vehicles in 2017. Along with China, the United States is counted among the largest automobile markets worldwide, both in terms of production and sales. About 6.9 million passenger cars were sold to U.S. customers in 2016, and around four million cars were produced here in the same year. The United States became a key automotive market in the early 1900s, when Ford introduced assembly line car production to mass-manufacture its Model T. Today, the Ford Motor Company still ranks among the leading manufacturers of passenger cars, its most popular passenger car model currently being the Ford Focus, which was also one of 2016’s best selling light vehicles worldwide. 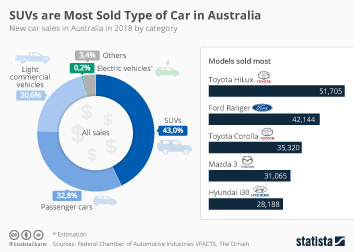 In terms of revenue, Toyota, Volkswagen, and Daimler topped the list of major automobile makers in 2016, while the automotive supplier industry was dominated by Bosch, Continental, Denso and Magna. Prompted by global initiatives, such as the Paris Agreement, several countries around the globe are enacting stricter emissions controls on new vehicle models. As such, automakers are beginning to expand their business into the electric mobility sector. Germany is expected to lead the way with projected electric car production to reach some 1.3 million units by 2021. Over the next decade, Internet-connected car technologies and autonomous vehicles are set to stir up yet another revolution in the automotive sector. In 2016, some 40 percent of U.S. respondents stated that they were willing to use fully autonomous vehicles, presumably because they consider autonomous vehicles to be safer than conventional cars. The global market for autonomous driving hardware components is expected to grow from 400 million U.S. dollars in 2015 to 40 billion U.S. dollars in 2030.